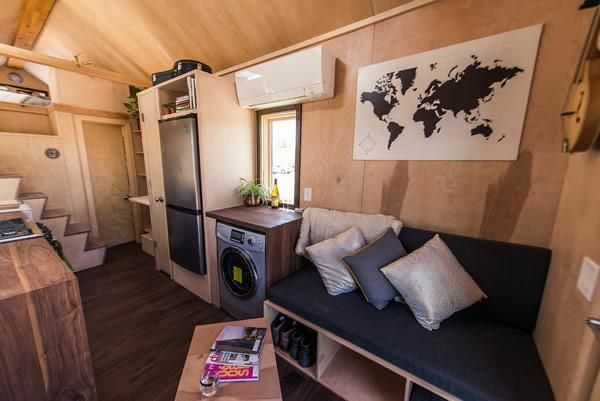 The Tumbleweed Tiny House Company of Sonoma, California, has been at it again, this time with the creation of a diminutive house on wheels that is both Lilliputian and fit for the road. 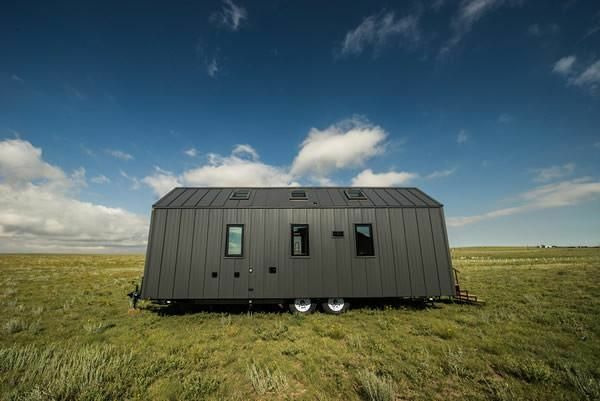 With a footprint that measures a remarkably small 148 square feet (about 13.7 square meters), the company has named this Western-styled abode the Farallon, presumably referring to the islands off the coast of nearby San Francisco. Discovered by Spanish explorers in 1539, these islands were named for their sharp rocks and jagged cliffs. But this house looks a lot more hospitable than that. 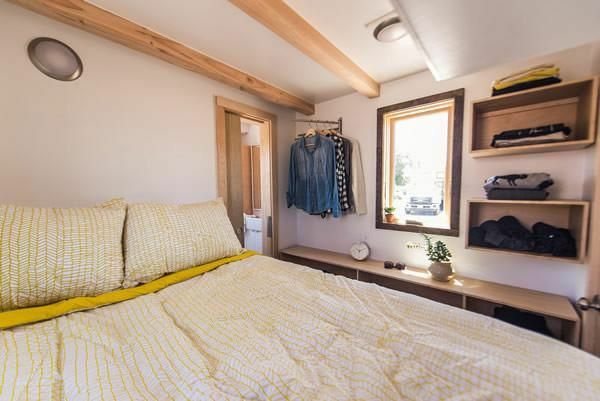 So hospitable is this house, in fact, that it has two gorgeous bedrooms, including a sleeping loft that can hold a king-sized bed and adds another 70 square feet (6.5 square meters) of living space to the home. 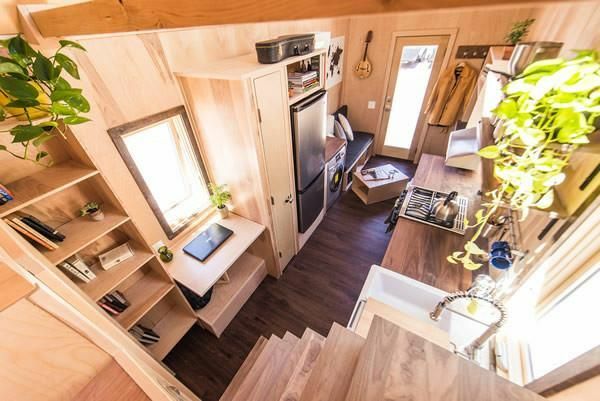 The map of the world hints at what this tiny house can do: It can travel. But there are some unique features on display here, as well, including the stairs that run across the trailer, rather than along its length. You can also see the very useful storage cubicles under the couch. 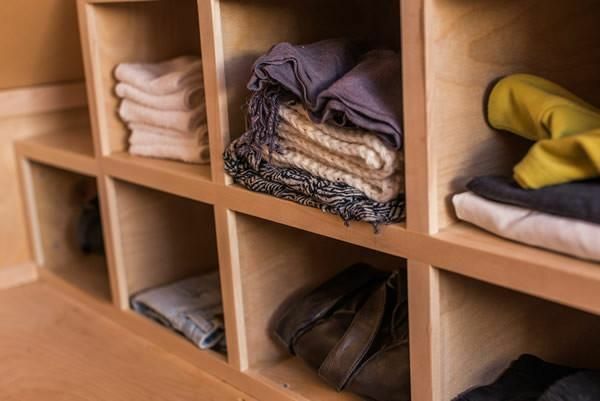 The Farallon has lots of shelves and storage cubbies. Here's a view from the bedroom loft. 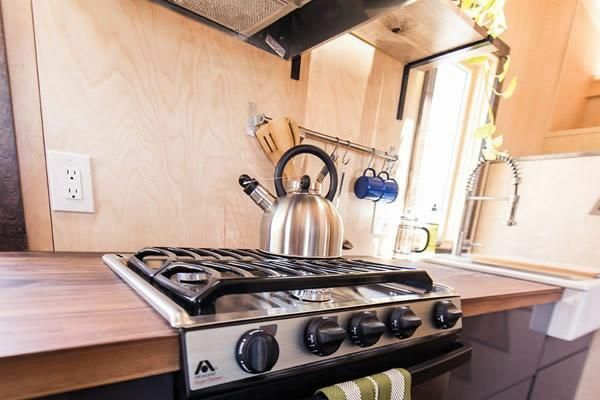 The kitchen is tiny, but it has what you need, including the apartment-sized refrigerator and freezer. Next to that, between the refrigerator and the couch, is the washer/dryer. 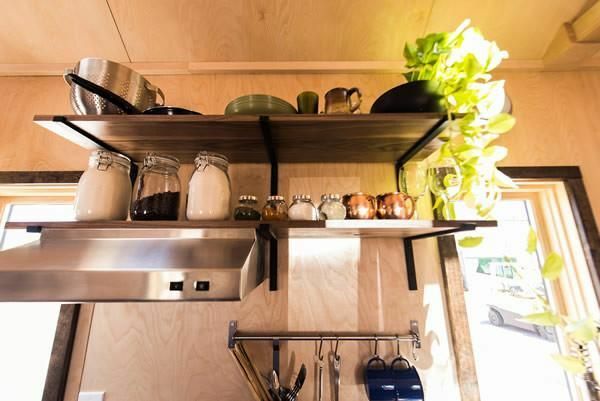 The kitchen includes a ventilation fan over the stove and plenty of shelves and racks for spices and cooking utensils. Tumbleweed offers the option of a full stove with an oven or just a cooktop. 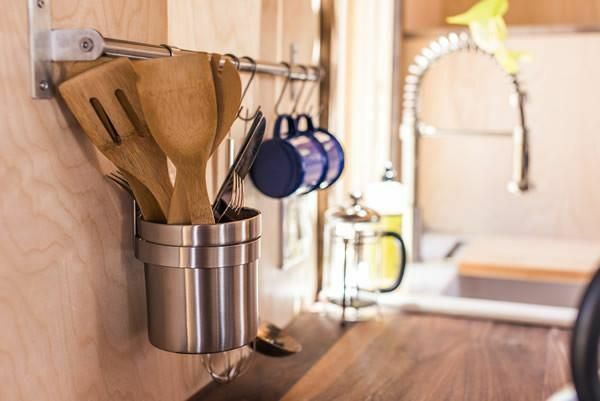 If you run out of shelf space, you can always hang a cup that will serve as a basket for utensils. Downstairs has a terrific bedroom complete with storage space and a tuck-away closet in the corner. The bathroom is on the other side of the back wall. 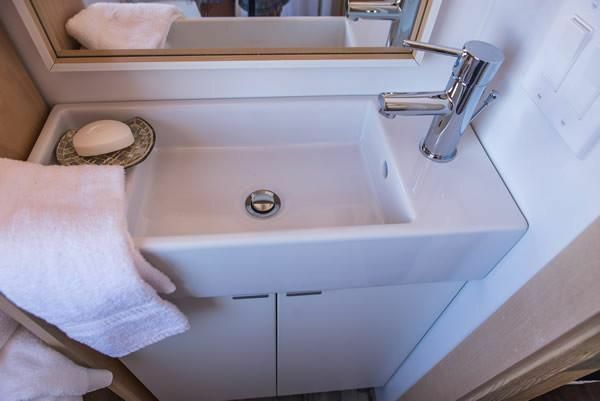 This is actually a fairly roomy bathroom sink for a tiny house on wheels. You can find sinks in some tiny homes that aren't big enough to fit your two hands. This one is not quite that small. 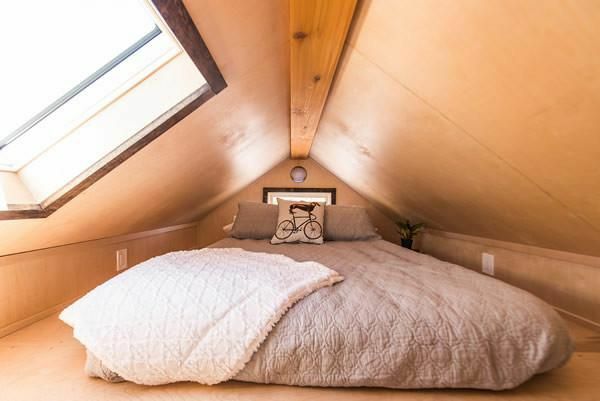 Upstairs is a great bedroom loft with plenty of light streaming from the ceiling skylight. The builders say that the loft will fit a king-sized bed if that's your preference. The company uses so much wood walls, floors and ceilings that their homes are said to be beautifully aromatic from all the pine, cedar and oak used to dress the interior. Yes, this is the same house. 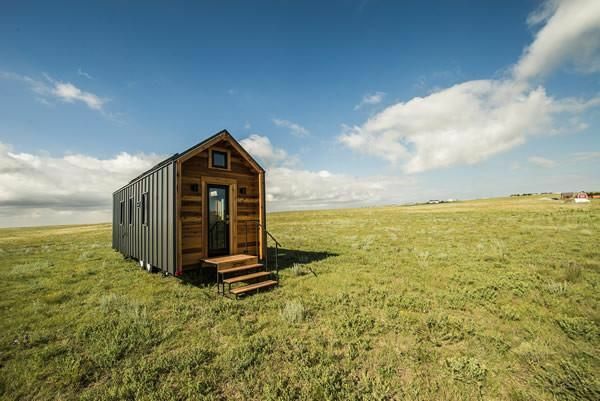 The front of the home has cedar siding, but Tumbleweed departed from that standard for the rest of the Farallon tiny house, which is both cozy and road-worthy at the same time.